Wednesday, December 3, 2008 6:00 PM SHARP! 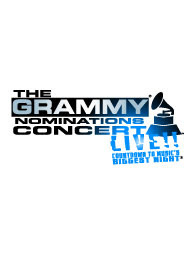 The GRAMMY® Nominations Concert Live!! – Countdown To Music’s Biggest Night will announce nominations in at least six categories, feature performances by past GRAMMY® winners and nominees including Mariah Carey, Celine Dion, Foo Fighters, B.B. King, John Mayer, and Taylor Swift, and will set the stage for the 51st Annual GRAMMY® Awards on Feb. 8, 2009. The special also marks the first time nominations for the annual GRAMMY® Awards will be announced live on primetime television. Following the one-hour live telecast, guests will experience a one-hour exclusive concert by John Mayer in celebration of the grand opening of the GRAMMY MuseumSM. Filed under: Grammy Awards | Tagged: Celine Dion, Foo Fighters, John Mayer, LA Live, Mariah Carey, Taylor Swift |	Comments Off on GRAMMY NOMINATIONS CONCERT: LIVE!